The term "social media" encompasses several different types of sites, and it's important to use all of them properly in order to really be effective at social media optimization (SMO). Blogs are of course one of the most common forms of social media, and there are significant benefits to having your own blog as well as building name recognition and credibility for your company through other industry blogs. But what separates SMO from SEO is that search engine optimization is about owning a top spot in the search engines for your website on a specific term, while social media optimization is about owning the entire first page of the search engines for multiple sites that point back to you for a specific term. So, here are some tips for using different types of social media sites for SMO. These are a place to showcase your expertise in a non-promotional way. For example, in an SEO forum, telling everyone how great your agency is at SEO is suicide; but displaying your knowledge by offering expert tips on title meta tag creation or non-spammy link building is brilliant. Sites like Digg, StumbleUpon, and Searchles are great places to spread the word about your own thought leadership content as well as, and even more importantly, positive coverage your company gets from other bloggers, journalists or analysts. But to really drive serious traffic from these sites, you need to know how to play the game with "power users" and the community. A wiki is another place to share your knowledge of a particular topic with a community or the world. You can do this by either writing an encyclopedic article about a topic; adding to or editing an existing article; or adding links to your own thought-leadership content as supporting material. Wikipedia is the best known but also the most difficult to work with; that leaves an opening for alternative wiki sites such as Google's Knol, open-site.org, Freebase and others which are less contributor-hostile. Unless you've been stranded on a desert island for the last four years, you know that online video is hot. YouTube now draws more than 70 million unique visitors per month. Business video production is growing exponentially because video is engaging, repurposable (for example, you can use a video on your website, at tradeshows and in presentations; post it on YouTube; use it as an asset for blogger outreach or a channel sales tool; add it to social media press releases; etc. ), potentially viral, and increasingly searchable. Creativity is more important than expense; think "big idea" before "big cost." Paradoxially, the investment required is inverse to company size. A small company needs to be concerned with professional production values in order to be taken seriously; big companies are better served by informal, low-bidget videos that make them seem more human. At the least, social networking services like LinkedIn, Facebook and Twitter provide increased exposure for your company (and your "personal brand") while also providing SEO and reputation management benefits. At best, these sites can help you make valuable new business connections. Using all of the tools of social media, ideally in an integrated fashion, maximizes your potential for exposure on key search terms among the widest possible audience. 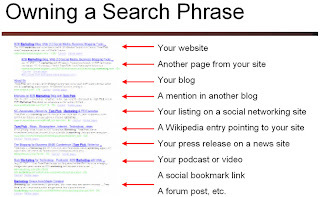 And it just may enable you to "own" the first page of the search engines for important long-tail search terms—SEO on steriods. it is different type of marketing when compared to all other marketing. It is easy way to market the products.